Are you looking for a natural, drug-free remedy to your child’s coughing symptoms? Sometimes, turning to drugs and active ingredients just isn’t the best path for our health in the long term. This is the driving force behind the creation of Zarbee’s Naturals Cough Syrup + Mucus. 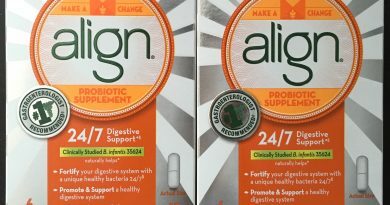 This dietary supplement is the #1 pediatrician recommended brand for resolving coughs and mucus. There is a day time and night time version in this three-pack edition. Not to mention, the primary ingredients are a special blend of dark honey and ivy leaf extract to help your child naturally. 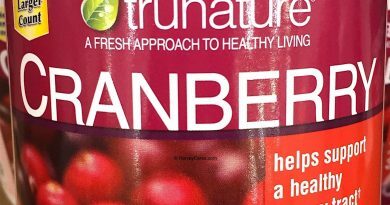 This Zarbee’s cough syrup has natural grape flavors and has no artificial sweeteners, dyes, or alcohol. It is also naturally gluten free. Additional, the cough syrup is touted as safe and effective for resolving coughing symptoms. Item name: Zarbee’s Naturals Cough Syrup + Mucus. Safe and effective for children 12 months or older. Dark honey and ivy leaf ingredients. Helps to clear mucus when coughing. There are no artificial sweeteners or flavors. Natural colors so no dyes. Main ingredients: Dark honey blend and English ivy leaf extract. Other ingredients: Purified water. Natural flavor. Citric acid. This cough syrup does not have any drugs or alcohol. There is also no artificial sweeteners or flavors. Moreover, you will be happy to learn that there are no dyes and the product is naturally gluten-free. 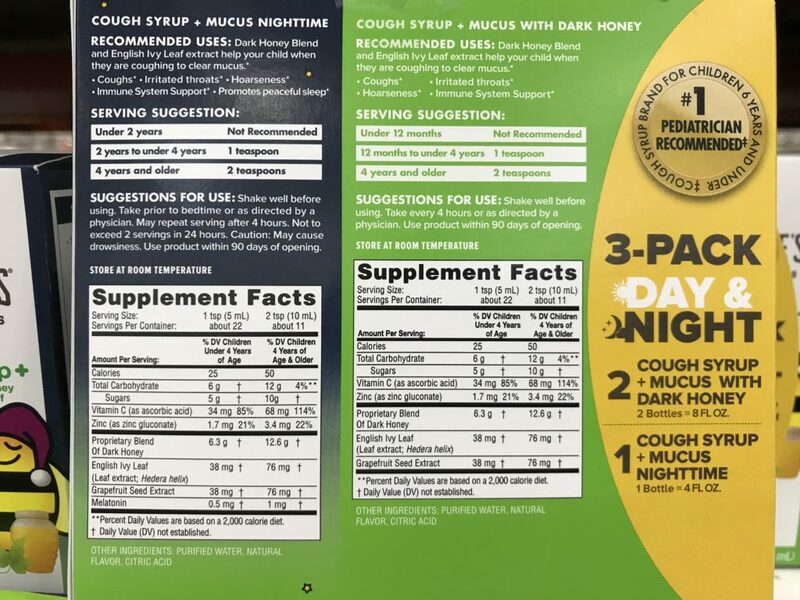 The night time version of Zarbee’s cough syrup has 0.5 mg of melatonin per one teaspoon of serving. This helps promote sleep as melatonin is a hormone that regulates our sleep cycles. 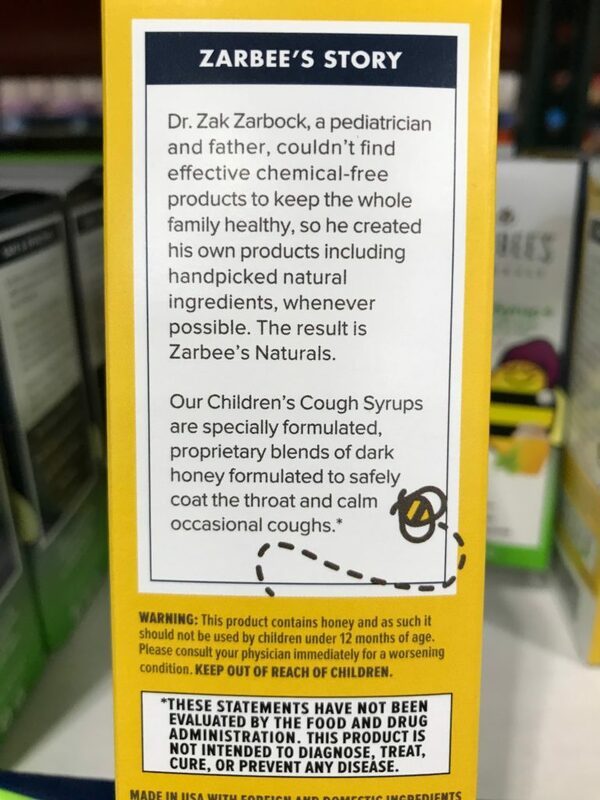 The Zarbee’s Naturals Cough Syrup + Mucus serving size depends on your kid’s age. 1 teaspoon is for children 12 months or older but less than 4 years old. For children 4 years and older, the recommended serving suggestion is 2 tea spoons. 1 teaspoon is about 5 mL and has 25 calories as well as 5 grams of sugars. You may have noticed the citric acid in the ingredients list. This ingredient addition boosts the vitamin C daily value percentage to 85% per serving. For the 2 teaspoon serving, just double everything for the amount of calories and sugar. Dr. Zak Zarbock is a pediatrician and father of children. He had a goal to provide his children with chemical-free products with a focus on natural ingredients. Many parents have the same goal and worry as well. Therefore, it’s not surprising that this cough syrup product is the number one recommended brand for children 6 years and under. 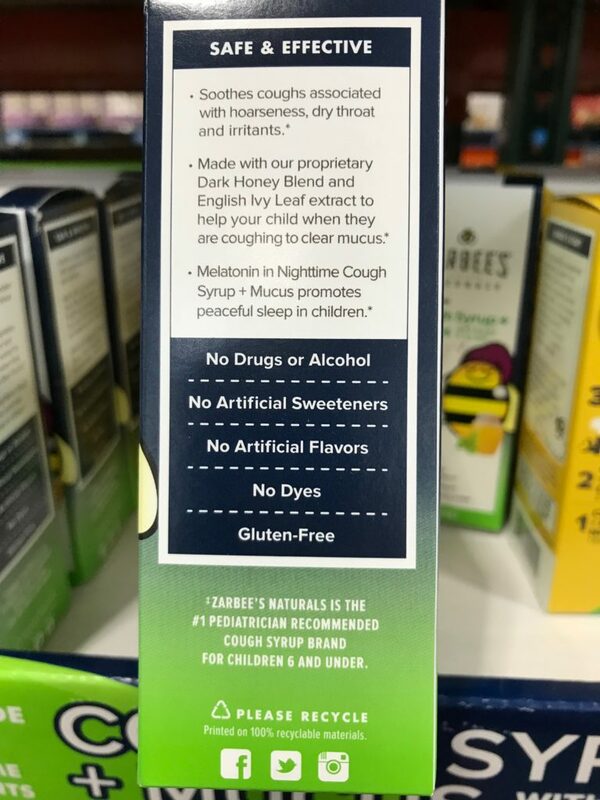 Zarbee’s proprietary blend of dark honey soothes your child’s coughs asscociated with hoarseness. As you know, dry throats and other irritants can exacerbate or worsen coughing symptoms. Since this natural cough syrup contains honey, children under 12 months of age should not use. 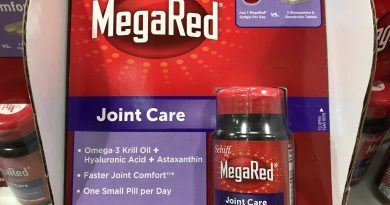 Also, as a reminder, since this is a dietary supplement and is not candy, please do not allow your children to have access to this without your adult supervision. 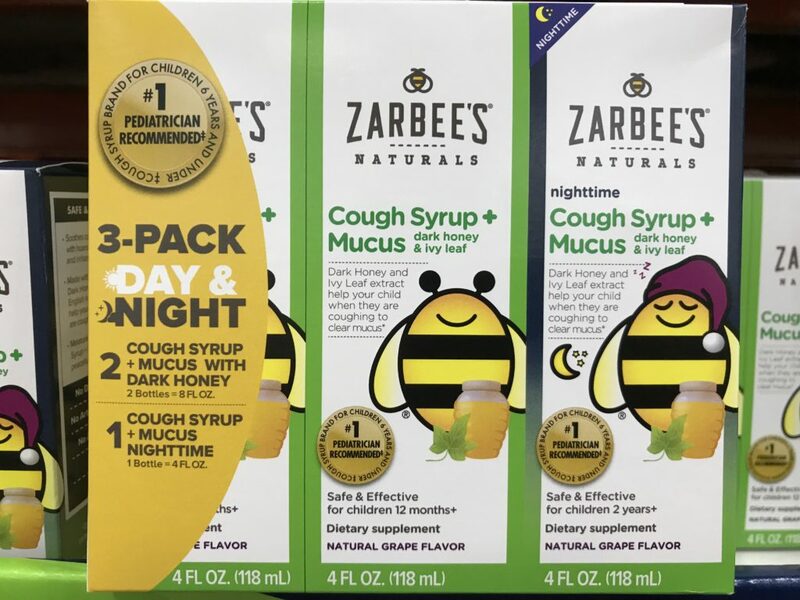 Looking to Purchase Zarbee’s Naturals Cough Syrup + Mucus? Usually I see this cough syrup in stock at most of the Costco warehouses I’ve been to. Based on my research, Amazon has this item in stock at the best price with shipping included. 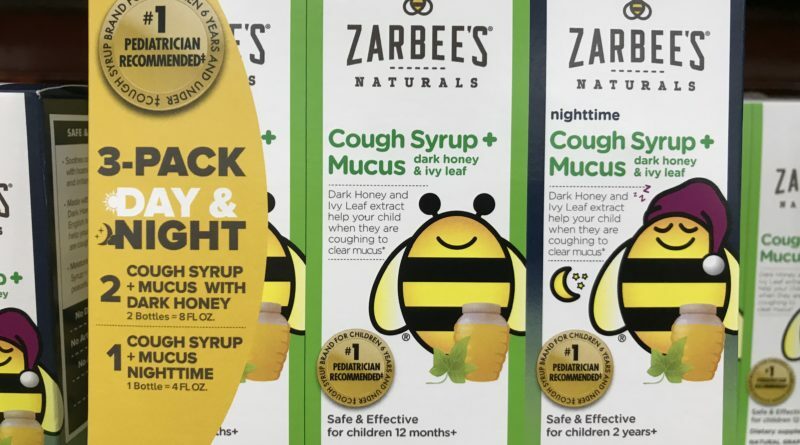 Have you bought the Zarbee’s Naturals Cough Syrup + Mucus before? Did you like it? Does your local store have the item in stock?